Traditionally speaking, garden rooms are separate, self-contained spaces away from the house – but they’re actually a fast and economic alternative to brick extensions! Recent statistics show we used to move house every 9 years in the 1980’s, but it’s now once every 20, showing we’re choosing to make the most of the space we have; an extension can be a very valuable addition! Whether it’s utilising an awkward space at the side of your property, doubling your lounge space or adding another room to your home, there are many benefits to choosing a Garden Spaces extension. Structural Insulated Panels – or SIPs – are a modern composite building material used in garden rooms. These panels simply slot together to be glued and screwed in place, providing strength and an airtight seal. They’re quickly becoming the number one choice for construction, as they reduce build time and can be made to complex and bespoke specifications. They’re highly thermally efficient, ecologically sound and very strong. Flexibility is key when it comes to building home extensions, no two families or homes are the same, so why should your extension be? 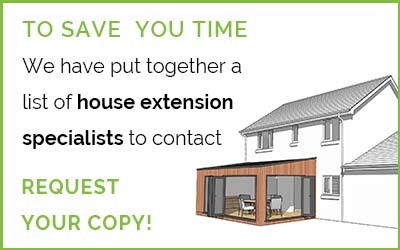 Whether it runs the full length of your property, has a roof overhang and decking to make the most of your garden, increases the space in an existing room or adds an entirely new one, the ability to make your extension your own is essential to getting maximum enjoyment from it. Perhaps one of the most important aspects of your extension will be the glazing and doors, often they can make existing rooms darker, so achieving the best light possible is essential. The construction of garden room extensions makes it easy for doors, windows, skylights and light tunnels to be installed, providing you with the best possible light and views! The SIPs construction offers a huge range of finishing touches, including cedar wood cladding – which is very popular for garden rooms – brick slips, so it matches the existing building or coloured render. You can even have a living roof installed, providing green space and helping biodiversity in your garden, meaning that your home extension is very valuable to much more than just the family living in it! You can see more examples of Garden Spaces extensions on their testimonials page.